My name is Richard. So what else do you need to know? Stuff about my family, or where I'm from? None of that matters. Not once you cross the ocean and cut yourself loose, looking for something more beautiful, something more exciting, and yes, I admit, something more dangerous. So after 18 hours in the back of an airplane, three dumb movies, two plastic meals, six beers and absolutely no sleep, I finally touch down... in Bangkok. Anyone my age surely remembers Danny Boyle's movie The Beach, a sun-drenched tale of a secret paradise discovered by beautiful people lusting after each other, rounded out with a killer soundtrack and a young, shirtless Leonardo DiCaprio. The Thailand-based movie opened the millenium to a lukewarm reception, probably because it didn’t translate well from book form, but the movie strangely has a special place in my heart. Maybe it’s the breathtaking tropical scenes and promise of new adventures. Maybe it’s because I agree with DiCaprio’s character Richard when he says we’re all looking for that “wow” experience that sets us apart from everyone else, be it discovering an untouched island in Southeast Asia or tasting the best unheard-of rum in the world or even finding an amazing restaurant before the critics get to it. But I probably like The Beach because it’s a complicated story of a man seeking paradise only find that the promised land is a farce. 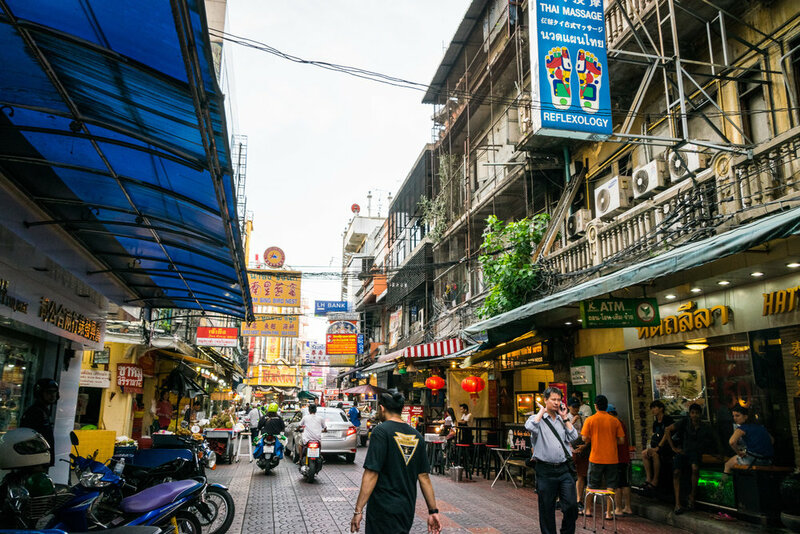 And that’s exactly how I felt about traveling in Southeast Asia: its alluring, exotic façade was exactly that, a façade covering the grinding reality of life in Southeast Asia. There was a lot about Bangkok and Thailand that I didn’t like, and little that I actually did. What did I not like? The long and expensive flight to the country. The pervasive monoculture of dirty, ugly concrete buildings. The oppressive heat and humidity. In-your-face poverty and ostensible wealth. The omnipresent smell of raw sewage and incense. Electrical wires, cars, motorbikes, trash, and malnourished street dogs everywhere. But what did I like? Inexpensive massages (less than $10 for an hour! ), surprisingly affordable top-notch medical facilities (a thorough teeth cleaning for $35! 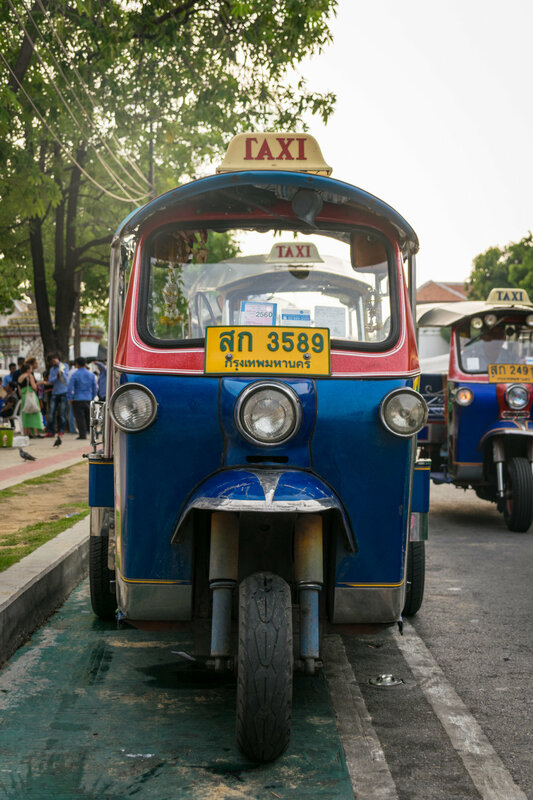 ), and a kitschiness unique to Southeast Asia (hot pink taxis! gold Buddhas! neon lights in temples!). And while people rave about Bangkok’s vibrant street food scene, they can have it; I strive to eat a clean vegan diet, so carts offering a bounty of meats and unknown fried things didn’t appeal to me (BUT I did love the carts selling fresh pineapple and mango). one of Bangkok's boutique malls; the fresh flower arrangements were unbelievable! There are many travelers that thrive in “adventurous” environments like this, and it turns out I’m not one of them. People in this category especially enjoy the rock bottom prices of Southeast Asia, and I equate low prices with low wages and standards of living; someone's gain is another's loss, in other words. I don’t regret my first trip to Asia and I think experiencing this part of the world was (mostly) worth the hassle. Japan is still on the top of my travel bucket list and I’d be open to visiting Indonesia and Vietnam, but for now I’m back in Europe enjoying potable water and septic systems that can handle toilet paper. After this experience, I learned two important things: one has to be in a certain mindset to visit countries like this, and traveling with a dog is not feasible unless you are willing to put up with significantly more effort and expense. As much as I tried during my month in Southeast Asia I never arrived at the point where I could relax and 100% enjoy the experience and I ended up cutting my trip short to book a long and expensive flight to Bosnia. Not only was I scared that I’d be stuck in Thailand for four months because Mango didn’t have a titer test to fly out (more on the nightmare of traveling with a dog in a future post) but I was also dealing with a complicated, stressful medical situation, two things that consumed my time, triggered a major bout of depression, and left me feeling completely helpless to the unknown. But negativity aside, I did manage to visit some interesting sights in Bangkok that were truly a feast for the eyes. Enjoy my photos of Bangkok! Apart from visiting the United Kingdom ages ago, I don't believe I've ever traveled to a purely-kingdom kingdom country like Thailand. The country's king for the past 60+ years, King Bhumibol Adulyadej, passed away last fall and the country is now in mourning for a one-year period. Thais are literally in love with this guy, worshiping the ground he walks on, which surprises me because not only was he born and raised in the US but he was purportedly worth $30 billion. That being said, black ribbons, large images of the king, billboard advertisements, even an announcement after the Air Asia safety check are opportunities for mourners to express their grief, and Bangkok is especially full of mourners. Hundreds of thousands of Thais are visiting the Grand Palace to pay their respects, and the green park nearby is being turned into an elaborate site where his funeral will soon be held. As for urban Bangkok, that's another post in itself. 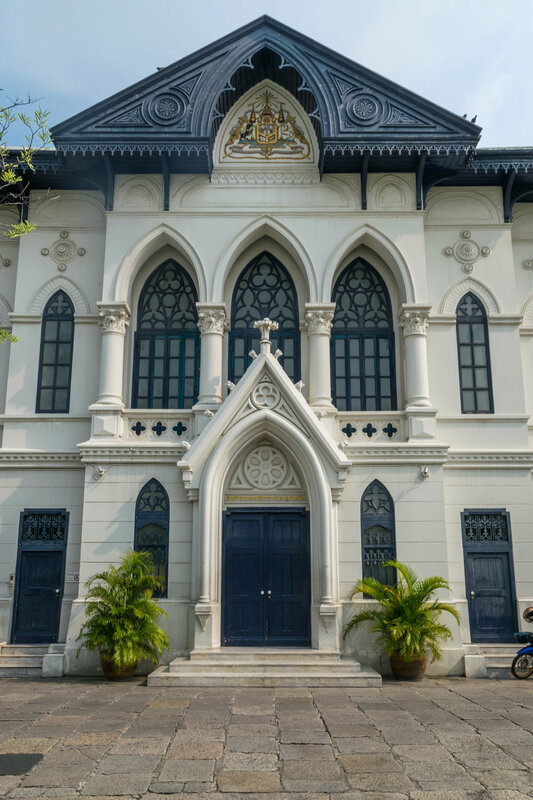 Since 1782, the Grand Palace has served as the official residence of the King of Siam. For a whopping $15, visitors are invited to cram their hot, sweaty bodies inside the palace gates to walk around the well-manicured grounds. Admiring the bright, whimsical buildings and temples was a delightful experience and it was fun to drink in all the architectural details (mirrors! mosaics! shells! lacquer!). 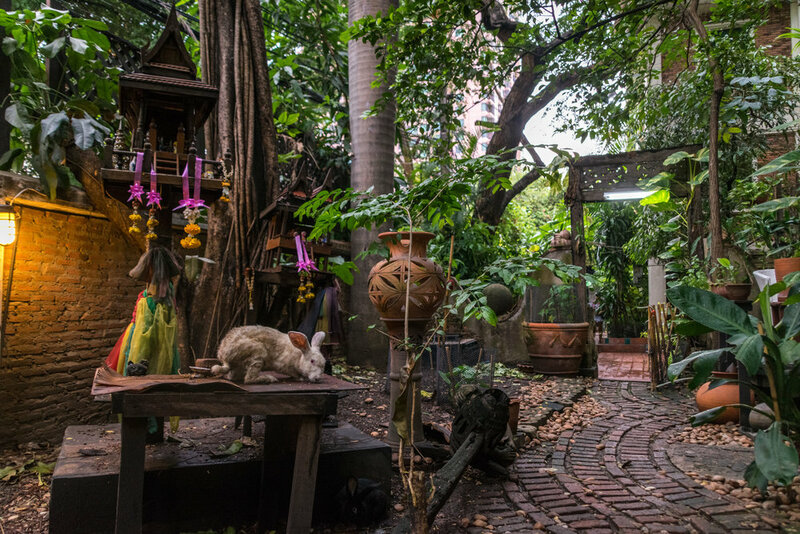 Unlike the palaces of Vienna, Thailand's Grand Palace is instead an organic complex of buildings, courtyards, gardens and pavilions. There were so many people at the temple that I couldn't figure out if visitors could actually go inside the palace building, but I'm guessing the cursory cordoned-off glance was the closest I'd get. A bit north of the Grand Palace is Wat Pho, or the Temple of the Reclining Buddha. 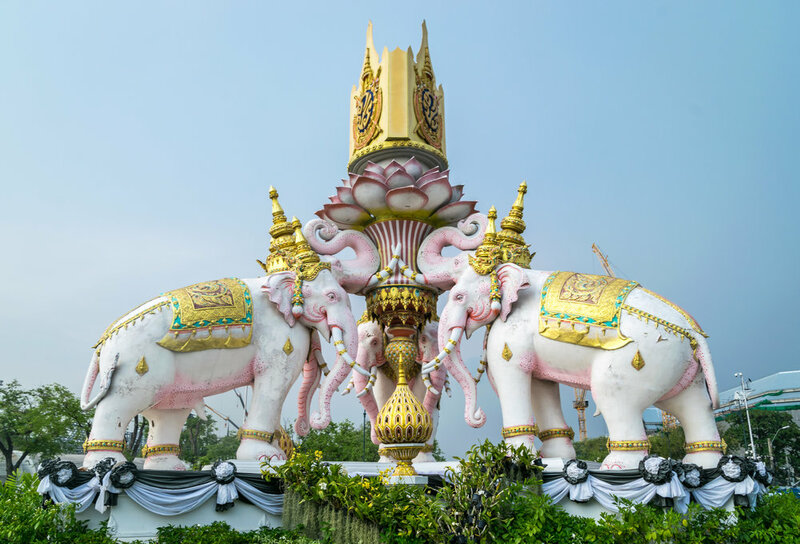 Bangkok is speckled with colorful, borderline garish, temple complexes welcoming visitors and Buddhists alike, and this one is unique in that it's one of Thailand's "highest grade of first-class royal temples." Information on its history is scant, but the temple was built before the 1800s. What original buildings remain at Wat Pho is unknown; I had a hard time distinguishing the age of these glossy temples, because they are so meticulously kept. Wat Mahathat is home to 28 Buddha statues, 108 holy monks, and 5 Buddha thrones. Instead of paintings, the temple has wood carvings that depict Buddhist history and art as decoration. Call me culturally ignorant, I never completely grasped the concept of what to do as a visitor to Buddhist temples: who are all the locals standing around? are vendors selling things to visitors... or Buddha? is it okay to freely walk the grounds and take photos in a sleeveless shirt?? Seeing one temple was fun, but after a while they start to run together. 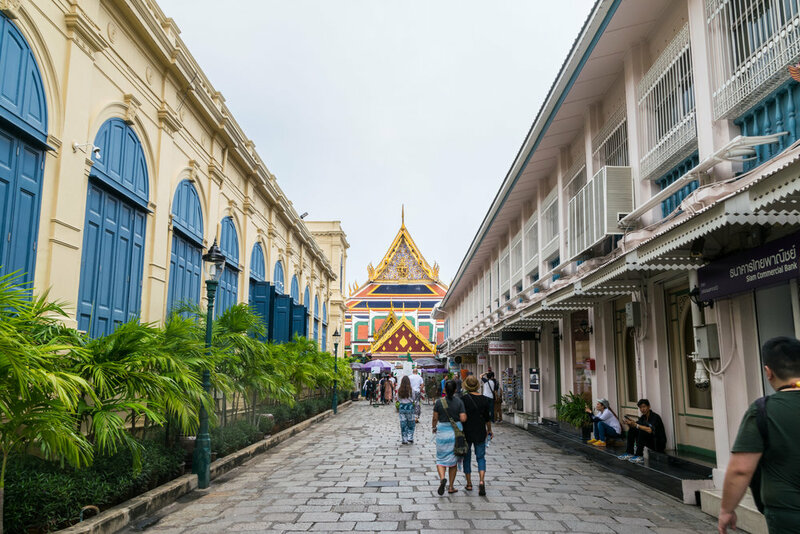 I didn't make an effort to visit other temples in Bangkok (the city is so spread out) and that was fine with me, but it was still nice to pass one and admire the occasional amusement-park-with-no-amusements complex known as a Buddhist temple. The entrance fee to the temple for foreigners is about $6 (200 baht) plus 20 baht to rent a shawl if your shoulders are uncovered; paying to visit a religious site was something new and surprising to me.